9 ladies stayed here the 1st week of November. A lovely clean hotel. Good food and plenty of choice. Staff were friendly. We needed a birthday cake for two in our party and it was no problem. Location is great, near the beach/shops/bars and restaurants. There was entertainment on every night and looked good but we didn't stay for it. The pool area very good also as well as clean. A ‘so called 4* hotel’ not so! This is the worst so called four star hotel I have ever stayed in. The good food was ruined by always being cold in fact the only food on the buffet that was hot was the chips. If we hadn’t noticed that at the end of the buffet counter there was chef cooking eggs and omelettes in the morning and fish and different meats in the evening we would have starved. We did not have one night’s full sleep for the noise from adjoining rooms and children running up and down the corridors. We could not use the Jacuzzi for a few days because it was full children whose parents thought it was a kiddies pool with bubbles. How no one wasn`t injured I don`t know because there was no supervision around this area the so called was watching the deep pool, so cold that no one was in it. Also I’d like to know what idiot invented the system that, although we had A/I bands on we had to wait after getting drinks while the barman printed a till receipt for us to sign. I could go on all day but suffice it to say I will not be coming back to this so called four star hotel and Thomson's should be hanging their heads. 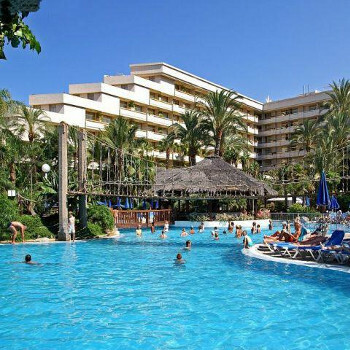 the best hotel was not english friendly about 95% of guests were all inclusive and were always pushing in and getting served at the poolside bar 1st even though we had been stood patiently in a queue for 10 minutes and the bar staff were letting them. this was brought to the attention of our reps after the third time of it happening, we were informed that we weren't the first to complain about it.the reps from thomson's were always on hand and did a good job at dealing with our gripes.I took my 8yr old grandson with us and he was bored, you couldn't have lilos in the pool, it also said no balls games either but everyone had them. we found some of the pool side bar waiters rude. The waiters in the restaurant are no better, there was no greeting, no smiles from them apart from asking us what we wanted to drink, they tried taking our plates before we had finished eating and then they would reach over us whilst eating without an excuse me. (no manners). we didn't stay to watch the entertainment. we wouldn't visit this hotel again, we have stayed in better.I will say daniel on reception was very friendly so if you do go speak to him. The hotel was clean and tidy; the food was the same as the film ground hog day (Repetitive). The hotel is about as child friendly as a Tiger to a zebra at feeding time. The life guard was ignorant and would not allow the children to dive/ jump /have inflatables or play bat and ball in the pool. But kissing petting and god knows what was happening under the water fall!! was allowed in front of the children. The first week we were woke by the workmen at 07:00 hrs each morning fixing the roof on the poolside bar. However this gave us the advantage over Germans to get enough sun-beds to cover our group. Our room was situated on the poolside of the hotel but the only access to our room was through the Piano Bar, My husband and son were told of daily for not wearing a shirt after leaving the pool to go to the room. Surely there should be separate entrance to the accommodation???. I would not recommend this hotel to any family. We stayed at this hotel in june 2007 for our honeymoon it was lovely, so we decided to go back this year for our 2nd wedding anniversary. The hotel is very clean, the food is lovely but not always hot, the location is perfect the restaurant staff are lovely. We stayed for 10 nights in a suite room 513 it was lovely and the balcony was big. On our departure day everything changed 40 minutes before we were due to get picked up to go to the airport our room was broken into the patio door was ripped from the concrete wall. All our valuables were stolen as well as clothes, passports, flight tickets and the tape of our honeymoon from 2 years before all we have is memories as we have not got a copy of it. We reported this to the hotel management and security guard, they took some photographs of the door. We asked them if they had phoned the police and they said no,we asked them again if they were going to phone the police and again they said no. They were more interested in the door than what had happened to us, the Thomas Cook rep told us we had 10 minutes to throw everything back into the cases and go down to reception as the hotel were going to pay for a taxi to take us to the airport as we had missed our coach. When we got down to reception the Thomas Cook rep told us we were on her coach as the hotel had changed their mind and would not pay for a taxi after all. We will definately not be staying at this hotel again, we were disappointed with the hotel staff as they did not seem interested in our situation and could have done a lot more to help us. In actual fact they seemed to want rid of us as soon as possible. Since returning home Thomas Cook have told us they will not inform us of any outcome to the investigations of the break-in. We advise that if anyone is staying at this hotel in the future to be vigilante at all times. stayed in this hotel in february 2009 on a get away winters break. The hotel needs a lot of updating especially the rooms and the sitting areas of the hotel.Inside there is a lot of concrete walls etc which makes the place feel very cold. We could not fault the setting,the food,the prices of the alchohol or indeed the staff. Nearly everyone in the hotel are on a all inclusive package and we brits seem to be omitted. The entertainment in the evening was very average. It was ok but as others have said there are better places to stay. On arrival around noon , check in was very efficient and staff were polite and helpful. Th hotel looked clean and comfortable. We were given a room on the 4th floor 443 which was quite small. but hey you only sleep there, however on opening the balcony doors we were amazed to find a massive balcony, must have been 40ft long and 20ft wide! reason being our room was on the corner of the hotel which incidently overlooked the yard below where all the empty bottles etc were sorted. The room was clean enough but looked a bit tatty in areas and no drawers for underwear etc.. It was cleaned every day, however we did seem to have a fusty smell in the bathroom, presumably drains. I mentioned it at reception and to the maid, but they just sprayed with a freash air spray, so it didnt stay away for long. Location of the hotel was very good , central for beach, shops and entertainment areas. We noticed that most of the other guests from europe, had on wrist bands, on enquiry it seemed they were AI, an option not available to the English guests!! Food was good and there was always something you could find to eat. There was always a good selection of meat and fish cooked to order. Same at breakfast with eggs. Just returned from a week at this hotel and thoroughly enjoyed ourselves. All staff are very friendly and helpful. Hotel was very clean. Room spacious and even had a fridge. Swimming pools lovely but quite cold. Entertainment was quite good. Hotel close to some good shops, bars and not far from the beach. Would definately recommend this hotel. We decided to book not long before we went, our original booking was cancelled by the tour operator, reason unsure.So I was delighted when we got in at the Tenerife Princess, as Mum and dad used to stay here a few times, unfortunatley dad died 2 years ago, so its mums first holiday away since, so she was thrilled to come back here. We stayed on a half board basis, food was lovely and was always being filled up with more fresh food, I had a 5 yr old and a 1yr old with me, they both had plenty of choice, most mornings though, we went out, as I found it easier, pretty stressful sorting out 2 kids meals and my own! The location is great, only a 5 min walk to the "patch" where we went most nights to the "Brahms and list" great entertainment bar!, beach only a short "Flat" walk. Hotel staff were lovely, very friendly. We had a large family room it was very nice, though we did have a problem with the shower head! room 512! As this was a large room, its built in the corner to give the space, but with that you gat a very small balcony, but cant complain, had the sun in the early evening. Only stayed in the hotel once to watch the entertainment, missed the kiddie disco, but sat through bingo! the entertainment that night was good though, we prefered to go out to the local bars. The pool was vey clean, though if you dont get to the pool early you dont get such good beds, so on the last day I was having non of it, and did the deed, yes, I put 3 towels on beds near the pool!, its the fist time ever, and it was my last day! We would definately return here, a really good base, and quiet at night too. The hotel is very impressive upon arrival. The reception staff were efficient and dealt with our queries promptly. The hotel is very clean but maybe the corridors could do with a lick of paint. Our room, 442, was excellent and the balcony was fantastic!! 2 sun loungers with plenty of room to spare. We had specifically asked for a room wit a sunny afternoon balcony and that is just what we got. The food was good and there was plenty for everyone. It was fresh and was always been tended to. The entertainment was ok - some better than others.